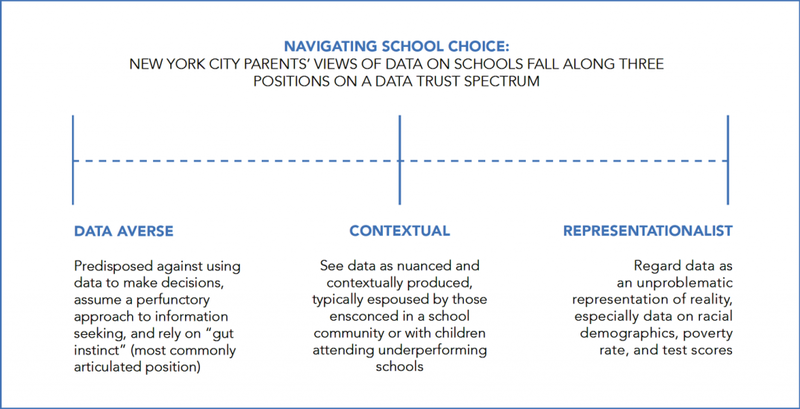 Spectrum of Trust in Data offers a framework for understanding New York City parents’ and guardians’ orientations toward publicly available school data. Data & Society Researcher Dr. Claire Fontaine and Research Assistant Kinjal Dave performed a qualitative, semi-structured, interview-based study with a socio-economically, racially, and geographically diverse group of 30 New York City parents and guardians between May and November 2017. Interviews focused on experiences of school choice; and data and information sources. This report illuminates an important gap in common assumptions about the market-driven ecosystem of school choice. Fontaine and Dave find that the data displays produced by the Department of Education (DOE) for parents are for the most part unused, buried on the DOE site, and difficult to comprehend even for those with high information literacy. Instead, parents turn to Google, school websites, and independent school review sites, such as InsideSchools and GreatSchools. Furthermore, the authors find that the information sources that parents favor (InsideSchools and GreatSchools over DOE dashboards) “digest” the data in a way that reinforces the correlation between poverty, minority populations, and low test scores. Data averse: Predisposed against using data to make decisions, assuming a perfunctory approach to information seeking and relying on gut instinct; this orientation was the most commonly articulated position. Contextual: Data is seen as nuanced and contextually produced. This view is typically espoused by those attending underperforming schools or ensconced in a school community. Representationalist: Data is regarded as an unproblematic representation of reality. Data on racial demographics, poverty rate, and test scores are often viewed through this lens. 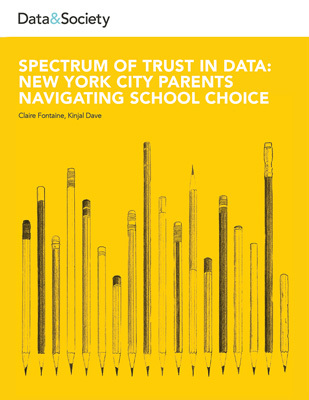 This report is the cumulative work of the Data and Equity in School Choice project, which aims to better understand whether, and in what ways, and to what ends, parents and youth draw on publicly available school performance data when making decisions about where to apply and enroll.